Addressing the subject of color management, this book explains how to achieve a desired effect with step-by-step instructions. It is accompanied by a CD-ROM which includes sample files for practice as well as tutorials and software. It is useful for graphic designers, those in prepress/print. Color Management for Photographers: Hands on Techniques for Photoshop Users, by Andrew Rodney, addresses the difficult subject of color management in a way that can help you get real work accomplished. This is the first book that moves beyond esoteric color management theory and detailed explanations of how things work to explain how to achieve a desired effect with step-by-step instructions so you can get on with creating and printing successful images. 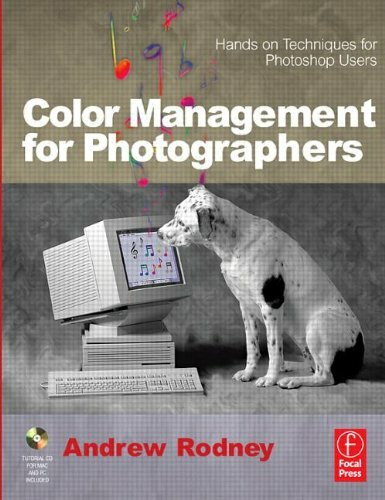 Complete with what-button-to-push-when explanations, this guide will help you navigate color management and further solidify comprehension of techniques with self-paced tutorials that enable you to practice what Rodney preaches. This practical, learn by doing approach is enhanced by the accompanying CD-Rom which includes sample files for practice as well as tutorials and software. Written with the photographer in mind, this book is also a great hands-on guide for graphic designers, those in prepress/print and, more generally, the majority of people who feel color management is too difficult. This book will help to explain this difficult concept in terms you can understand so that you may control and enhance your photographic vision.